Making a “Mind Jar” for Kids! | Dr. Lori Gray Ph. D.
← Comfort in the Chaos? Making a “Mind Jar” for Kids! A “Mind Jar” is a relatively simple tool for helping kids (and adults) appreciate mindfulness. This past week I offered some suggestions to the school counselors for the local district and I made some mind jars to share. A few participants asked for the recipe, so I promised I would post it here! 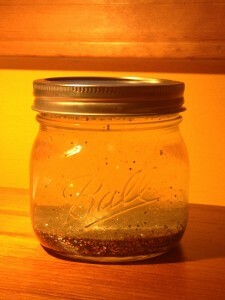 A Mind Jar can be shaken, and it is filled with glitter. The glitter represents how busy our mind and body can be with thoughts and physical sensations, such as anxiety and worrisome thoughts. For kids, shaking up the mind jar is way of expressing how they feel. Watching the glitter slowly settle and noticing the breath while doing so teaches kids a way of self-regulating their emotions, and allowing thoughts or reactive tendencies to settle…..just as the glitter settles. Eventually, we can see more clearly through the jar, just as we teach ourselves to allow the mind to settle, we “pause” and learn how to respond to a situation more skillfully, rather than impulsively react. Pretty cool! This is obviously a glass ball jar, but any container can be used. I’ve experimented with peanut butter jars and various plastic containers. Glass is easiest and clearest, but plastic may be more practical for kids, especially for tiny hands. So, what’s the trick? It’s not that difficult to make, nor is it an exact science, but here are my guidelines (and I’d love to hear what you learn as you try it yourself!). Choose your container(s) and heat enough water to fill the container almost to the top (quite hot water, but not boiling). When water is heated, ideally in a large measuring cup, add a lot of glitter glue (any color) and whisk it so the glue doesn’t clump. 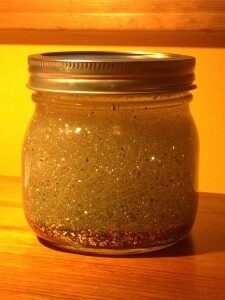 Essentially, add glitter glue as well as any combination of colors and textures of regular glitter. Add a few drops of a clear dishwashing soap (like Dove) and a far amount of glycerin (this thickens the water and makes the glitter drop more slowly). If you can’t find glycerin at your local craft store, I’m told that light colored corn syrup also works well. Now here is the in-exact science of it: Put the lid on tight after you’ve poured your mixture over into the mind jar container. Shake it up and decide for yourself if there is enough glitter, too much glitter, and if the solution is thick enough to suit your liking. If you want to make adjustments, pour the solution back into a mixing cup and adjust the thickness and amount of glitter. Just repeat until you are pleased with the way your Mind Jar “behaves” when you shake it up. When you’re satisfied, use a super glue adhesive to seal the lid on tight and prevent leaking (or a child opening it up!). And voila! Have fun with your Mind Jar! Adults love them too……. 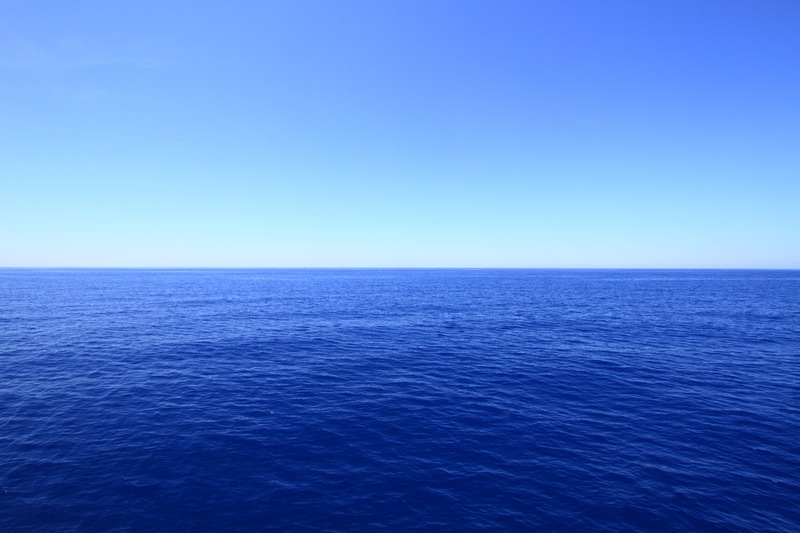 This entry was posted in Emotional Health, Mindfulness, Stress, Uncategorized. Bookmark the permalink. 15 Responses to Making a “Mind Jar” for Kids! This is great! I can’t wait to make some and try them out! Thanks for sharing. Why use glitter glue, and what happens if i don’t? What is the purpose of the dish soap? This is a brilliant, simple way for young children to understand what happens when they get angry or feel anxious. Teaching them simple breathing techniques as they watch the glitter slowly settle, settles and calms them. Brilliant. Every young child should have one of these. I am developing a kindness curriculum for little ones and would like to offer the mind jar as a mindfulness activity. I think it’s wonderful and am asking permission to use this idea. Thank you in advance. This is great! I have some questions in regards to this but noticed your email isn’t working. Could you please provide your email if it has changed? Thank you, Lori! How to make calming jar with cold or warm water for children. How much water for a 20 oz. Plastic jar? Join our mailing list to receive the Mindful Michigan Newsletter. I am now a full time professor at Western Michigan University in Kalamazoo, Michigan. I'm teaching mindfulness to university students and later this year will be teaching again in the southwestern Michigan community. To remain updated on workshops and other mindfulness courses (online as well as on site), please subscribe to the email newsletter through the form above. Thank you! Click here to view our page on Facebook! As a result of the stress reduction workshop with Lori, I can finally enjoy my life without as much anxiety because I now have tools that I can tap into myself and control. I am now also authentic with myself, relationships and life. Before I hired Lori, I struggled alone. Through our work together, I have learned to trust my own abilities and more effectively use my strengths. As a result, my life today is more satisfying and I know myself to be someone who is strong, resourceful, and intuitive. One of the most valuable “gems” I received from Lori was a thorough explanation of the stages of change that everyone goes through and what made change so challenging for me. I was stuck and not sure about making change; Lori helped me realize that until I was willing to make a commitment both mentally and emotionally, I would only continue to feel frustrated and berate myself. I highly recommend Dr. Lori Gray Boothroyd! I took the stress reduction course with Lori last year. I came to the class primarily to reduce stress in my life and found so much more…..a way of living that is slower, takes in more of life so I am present for more joyful moments. I think everyone experiences this class in their own unique way. Lori does an excellent job of guiding and inviting participants to find their own awareness along this journey. Thank you Lori! I feel calmer and clearer. I am more compassionate to myself and others. I wear my own truths more clearly, and I feel braver in attending to them. I trust more, in a faithful way, I feel safe, supported and secure in my life. Would I recommend the stress reduction class to others? Oh gosh! I’d say to not wait until you “have time” – that will never happen! And the more you believe you don’t have time….the more you need to take this class. Do it, jump in, and priorities and sense of time will follow, naturally. It’s a tremendous act of self-care with heaps of unexpected benefits – both shared with fellow classmates and highly individuals ones. Take the time and take the risk. It’s of immeasurable value! Dr. Lori Boothroyd coaches in a warm, dedicated manner that makes the process of positive behavior change a series of highly productive, enjoyable events. Lori taught me how to expand my mental capacity to visualize and implement positive outcomes in the areas of stress management, nutrition, inter-personal relationships and business growth. Thanks to Lori, I have learned to “live in the moment” and I am currently enjoying life to its fullest. In Lori’s course on Mindfulness and stress reduction, I have learned to slow down, both physically and in my little monkey mind. I hope that I am a better listener and observer of situations before I act. My mind feels spacious, not crowded with thoughts. I learned that anxious moments and thoughts don’t define me. I am more than my thoughts! The stress reduction class taught me how to increase levels of self care leading to decreased stress levels and overall improved quality of life. This class is about getting to know yourself better and being more “awake” during your waking hours. After the stress reduction class was over, I felt positive changes to the goal of not treating myself so harshly. It was an eye opening experience! I encourage anyone to take the class because it is a gift to yourself to learn how to respond rather than react in stressful situations.